The Seattle Symphony’s spring tour features performances in Palm Desert and Las Vegas as well as a two-day residency at the University of California, Berkeley. 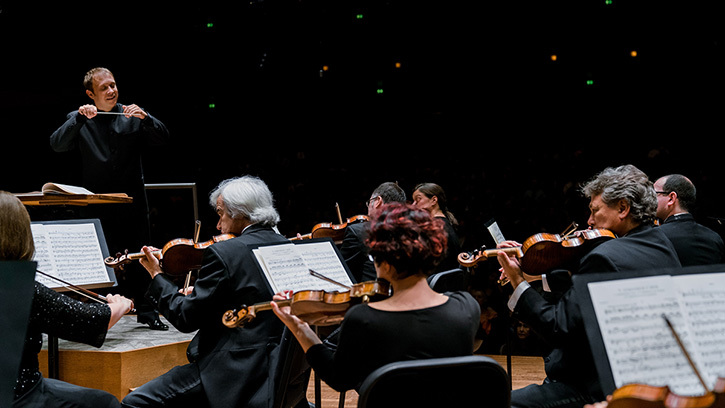 Music Director Ludovic Morlot and the Seattle Symphony will embark on a three-city tour, April 4–8, with performances in California and Nevada. Morlot and the orchestra will be joined by pianist Jeremy Denk in Palm Desert and Las Vegas before heading to a residency at the University of California, Berkeley. There, audiences will be the first to experience unique, back-to-back performances of John Luther Adams’ Become Desert and Become Ocean on consecutive days. Additional activities, such as artist discussions and masterclasses, will be held on campus at UC Berkeley. The Seattle Symphony commissioned and premiered Become Ocean in 2013 and the piece went on to win Pulitzer and Grammy awards. Following on the success of Become Ocean, the orchestra presents the world premiere of John Luther Adams’ Become Desert on March 29 and 31 at Benaroya Hall in a program including Beethoven’s Piano Concerto No. 5, “Emperor” with Jeremy Denk. Tickets — This concert is currently sold out. Become Desert was commissioned by the Seattle Symphony with the generous support of Dale and Leslie Chihuly. Become Ocean was commissioned by the Seattle Symphony with the generous support of the Lynn and Brian Grant Family. If you have family and friends in these areas, let them know the Seattle Symphony is coming to town! You can follow the orchestra’s travels on Facebook, Instagram and Twitter. For information about patron activities around the orchestra’s Palm Desert and Berkeley concerts, contact Donor Relations at 206.215.4832 or friends@seattlesymphony.org.